The 26.21 metre motor yacht Serendipity Blue has been sold with Daniel Memper at Memper Yacht International acting for the buyer and seller. Built in GRP, Serendipity Blue was built by Italian yard Falcon Yachts, delivered in April 2005 as a Falcon 86 model and has remained under the same ownership until now. Accommodation is for up to 10 guests in four cabins consisting of a master suite, VIP suite and two twin cabins, each with a Pullman berth, and all cabins have entertainment systems, Sharp LCD television screens and full en suite bathroom facilities finished in granite. The saloon has a large U-shaped seating arrangement to port while to starboard is an entertainment system including a 42 inch Panasonic television screen on a rise and fall mechanism plus a surround sound stereo system. Forward is a formal dining area with seating for eight guests around an oval table. Al fresco entertaining and dining are readily available on the aft deck with a table and built in seating, and on the large sun deck complete with sun pads and loungers. Serendipity Blue underwent a long list of refits and upgrades in the winter of 2009/10 including an MCA inspection to ensure she is still compliant. 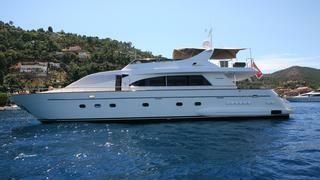 She was offered with a full range of water toys including snorkeling gear and a 4.3 metre Novamarine tender. Twin 1,800hp MTU engines give her a cruising speed of 24 knots and a top speed of 28 knots. Serendipity Blue was asking €1,480,000 with VAT paid.